Entertainment Weekly recently released an exclusive clip for the new Thor: Ragnarok film showing part of the initial meetup of Thor and Hulk. It also shows just how popular Hulk is on the planet Sakaar. But of course you can’t beat the look of numb fear across Loki’s face. The last time Loki and Hulk crossed paths the trickster god got a major spanking. So it seems in further celebration (and to continue sucking every dollar out of us Hulk fans) of Thor: Ragnarok, a number of theatre concessions have been revealed. 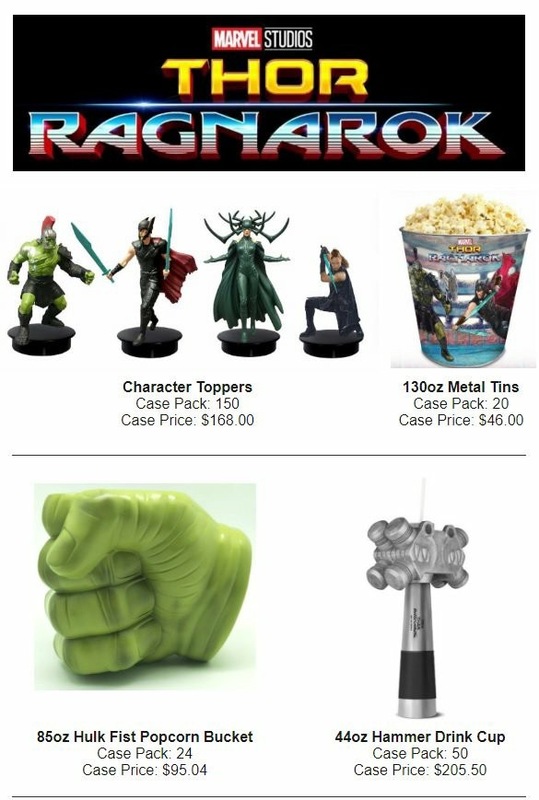 The highlights being the Hulk popcorn bucket (I want) and the Hammer drink cup (yeah I’ll have that too). The drink toppers are kinda cool too! I hope theatres near me get these! Feast your eyes! November is still too far away. Oh…and in case you missed this…yeah….seems the first official trailer for Ragnarok dropped. Yeah…no big deal. At least now I have something else I can watch on repeat aside from that teaser from April. So yeah…check it out…I guess. Isn’t this just glorious? This…is a thing of beauty. I have always wanted a Hot Toys Hulk. I may skip ALL the rest of the Gladiator Hulk figures and get just this ONE. Honestly it’s a toss up between this one and the Mezco Hulk announced. Basically it will depend on final cost, the final “real-world” product (cause the street item doesn’t always match the show item), and of course my budget 😦 . Figure seems to come with an interchangeable head without helmet and a couple pairs of hands. Most likely the figure will sit in the $400 range. But come on…look at that skin. Look at that glorious armor! The weapons! The real-hair mohawk on the helmet. UPDATE (7/27/17): Pre-orders for this figure are now live on Sideshow’s site. Grab him while you can! Thor: Ragnarok – Hulk’s Warbound First Look?? Images have hit the internet showing some more toys related to the new Thor movie. They can be seen here. Included in these images are figures depicting multiple characters, but more importantly we get our first look at Korg and Miek! Based on these toys I have taken the liberty to draw what the characters might look like in the movie. This is a fairly quick sketch and given how stylized the figures ares, not to mention it’s of them at only one angle, the sketch is rather basic. However, we can see what details the designers decided to keep, and update, in regards to the Hulk’s warbound. Korg looks very much the same if not perhaps a bit older and of course he’s gray, not orange. Thus matching him up to the other Kronan witnessed in Thor: Dark World. He also has a bit more armor in keeping with how much more “dressed up” the Hulk is. The biggest surprise is Miek. In the comics and animated movie he looks like an anthropomorphoid Ant with two legs and four arms. Thin and obviously very frail. At least at first. Here the designers have taken that bug idea but went in the direction of a worm or beetle. Except this little worm is equipped with a mobile mech-suit complete with large blades. Part of me is sad they diverted so much from the original design. But at the same time I’m kind of digging this new look. This could provide other possibilities along the lines of him being a sort of Rocket Raccoon-type. Miek could be the withdrawn tech geek of the group. This bug form is also very larvae-like. Perhaps this caterpillar might become a butterfly someday…wink wink. In any case this continues to excite me as to how they are able to further re-invent the world of Sakaar. November can’t come soon enough.